ROCKE-3D simulation of a possible scenario for how an ancient Venus that began with a shallow ocean may have remained habitable for several billion years. 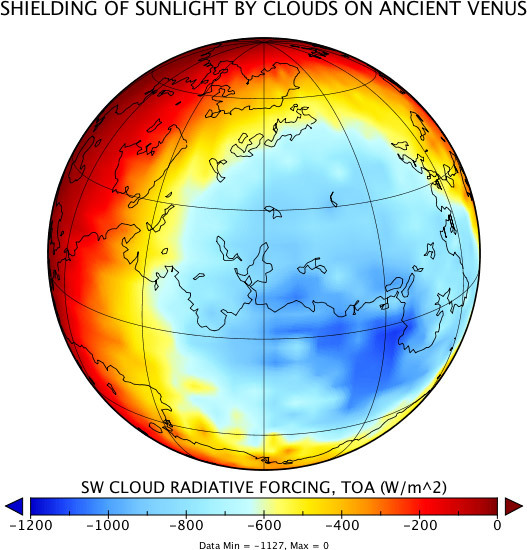 The figure shows the cooling by sunlight reflected back to space by clouds. Shielding of sunlight by cloud is strong on the dayside (blue colors). Near the subsolar point (dark blue colors), where the Sun is directly overhead, clouds reflect more than 1000 W of energy per square meter of Venus's surface area, an amount almost as large as the energy that Earth receives from the Sun. The discovery of exoplanets (planets outside our Solar System) has occurred at a rapid pace. Some of these planets may be habitable at their surfaces, in the sense that they are warm enough to sustain liquid water, a necessary ingredient for life as we know it. Knowing which ones are most likely to be habitable would facilitate the search for life. However, to date exoplanets that might sustain life have only been observed indirectly — through detection of the gravitational wobble due to the tug between planet and parent star, or through the dimming of the star's light as the planet passes in front of it. Until next-generation space observatories are able to directly measure spectral details, we must rely on theoretical understanding and on planets closer to home to ascertain the possibility of water and life for diverse planets elsewhere. The Solar System is home to the only known inhabited planet: Earth. Our Solar System's history, especially Earth, Mars, and Venus, has driven early thinking about concepts such as the “habitable zone” that have traditionally been applied to evaluate the habitability of planets discovered orbiting other stars. Three-dimensional (3D) planetary general circulation models (GCMs) derived from the models that we use to project 21st Century changes in Earth's climate can now be used to address outstanding questions about how Earth became and remained habitable despite wide swings in solar radiation, atmospheric chemistry, and other climate forcings; whether these different eras of habitability manifest themselves in signals that might be detected from a great distance; whether and how planets such as Mars and Venus were habitable in the past; how common habitable exoplanets might be; and how we might best answer this question with future observations. The NASA Goddard Institute for Space Studies (GISS) is part of the new NASA Nexus for Exoplanet System Science (NExSS), a cross-discipline effort that brings 18 teams of astrophysicists, heliophysicists, planetary scientists, and Earth scientists together to understand all the factors that determine exoplanet habitability, from stars, to their protoplanetary disks, to the rocky planets that form from them, to the atmospheres that determine their climates, to the planet-star interactions that determine which atmospheres remain stable over geologic time. The ROCKE-3D (Resolving Orbital and Climate Keys of Earth and Extraterrestrial Environments with Dynamics) team, a multi-institution collaborative project, is addressing these questions as part of NExSS. GISS's role in this project is to perform 3D GCM simulations of past climates of Earth and other rocky Solar System planets to broaden our understanding of planetary habitability, to use similar simulations to assess the habitability of rocky exoplanets, and to produce synthetic disk-integrated spectra and phase curves of these planets. The discovery of the planet Proxima Centauri b orbiting the star closest to Earth has generated much research about whether it has a chance to be habitable. With ROCKE-3D we have imagined Proxima Centauri b as an “aquaplanet” covered by water. Because the planet is close to its star, it may show the same face to the star all the time, as the Moon does to the Earth. If so, the dayside remains a few degrees above freezing (yellow colors). Elsewhere, the ocean is perpetually covered by ice (dark blue colors), except near the equator where winds and ocean currents push sea ice eastward onto the dayside where it breaks up and melts (pale blue to light yellow colors). Our project uses solar radiation patterns and planetary rotation rates from simulations of spin-orbit dynamical evolution of planets over Solar System history provided by our colleagues at the Columbia Astrobiology Center and at other institutions that are part of our NExSS team. In turn, the synthetic disk-integrated spectra we produce from the GCM will be used as input to a whole planetary system spectral model that emulates observations that candidate future direct imaging exoplanet missions might obtain (see the NASA Goddard Space Flight Center Haystacks project). Further support for GCM simulations of other planets and periods in history is provided by the NASA Planetary Atmospheres, Exobiology, and Habitable Worlds Programs, and by the Sellers Exoplanet Environments Collaboration. 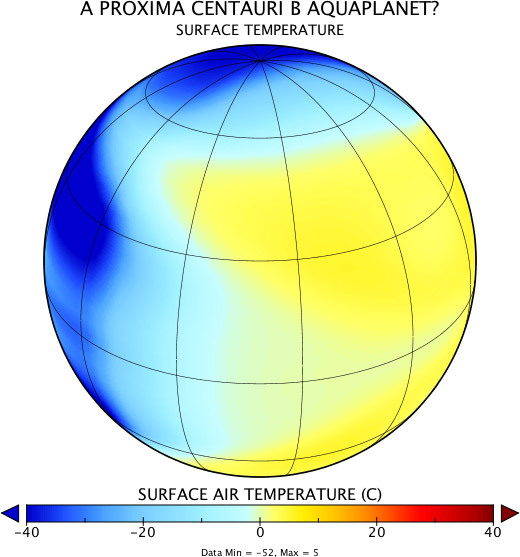 Maps of climate parameters from ROCKE-3D simulations of Proxima Centauri b, ancient Earth, ancient Venus, and modern Earth can be created here. Photosynthesis produces signs of life we can see from space: atmospheric oxygen and the vegetation “red-edge", a spectral reflectance signature of vegetation on land. Oxygen is produced through the splitting of water molecules during photosynthesis. The vegetation “red-edge” is so-called because healthy foliage absorbs light in the red with chlorophyll a (Chl a), which contrasts with strong scattering in the near-infrared. However, the Earth harbors a greater diversity of photosynthetic organisms than vascular plants, and includes algae, cyanobacteria, and anoxygenic photosynthetic bacteria, all of which occur in a wide array of colors, due to adaptation and acclimation to different light and chemical environments. This diversity raises questions about how photosynthesis developed on Earth, and provides clues as to what might dominate over a planet's history and yield alternative “biosignatures” on a planet orbiting a different kind of star from our Sun. At GISS, through membership in the Virtual Planetary Laboratory team of the NASA Astrobiology Institute, research by Nancy Kiang is probing the long wavelength limit of oxygenic photosynthesis. The cyanobacterium Acaryochloris marina is being studied as a model organism for alternative pigment signatures of oxygenic photosynthesis adapted, for example, to the light of red dwarf stars. In 1996, Japanese scientists discovered A. marina living on the light left over by Chl a organisms and able to stretch into the far-red and near-infrared through the novel pigment Chl d instead of Chl a. Research at GISS has quantified the photon energy use efficiency of A. marina in comparison to Chl a organisms, and is now turned toward investigating its light regime in nature to ascertain its kinetics of light use and competitive ecological niche. This informs NExSS ROCKE-3D modeling with alternative stellar spectra, the Young Sun as well as other star types. Simulations aim to understand how different irradiance spectra affect a planet’s habitability and climate dynamics and its radiance signature, due to the spectral absorbance properties of different atmospheres and different surface spectral albedos resulting from the gradual spread of life over land and adaptations of photosynthetic pigments to other light regimes. 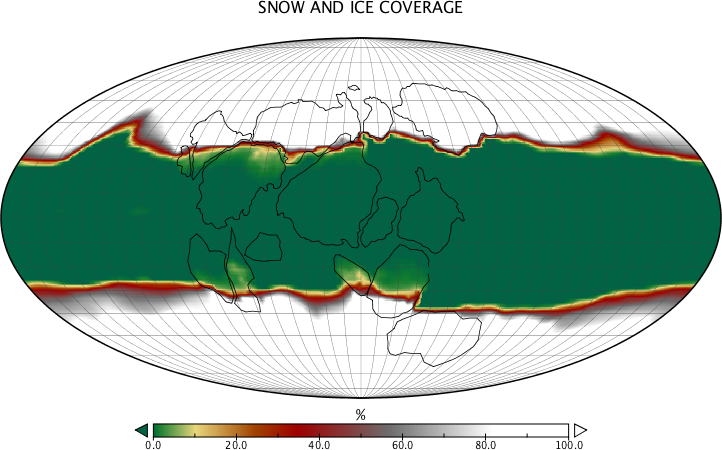 Snow and Sea Ice coverage from a Sturtian (~715 Mya) “Snowball Earth” simulation. Forcings applied include a reduction of solar insolation to 94% of modern and 40 ppm CO2). The position of the sea ice front is approximately stable by year 500, suggesting that a “hard snowball” solution (i.e., total Earth sea ice cover) may not be achievable for this particular set of climate forcings. A list of papers resulting from GISS Astrobiology — NExSS ROCKE-3D research is available separately. NASA/GISS: Anthony Del Genio, Michael Way, Nancy Kiang, Andrew Ackerman, and Gavin Schmidt. Columbia University: Caleb Scharf, Linda Sohl, Mark Chandler, Igor Aleinov, Kostas Tsigaridis, Sonny Harman, Michael Puma, and Sean Solomon. NASA/GSFC: Shawn Domagal-Goldman, Thomas Clune, Aki Roberge, Scott Guzewich, Alexander Pavlov, Avi Mandell, Melissa Trainer, and Michael MacElwain. NASA Postdoctoral Program: Christopher Colose (GISS). Other institutions: Rory Barnes (U. Washington), Russell Deitrick (U. Washington), John Armstrong (Weber State U. ), Ravi Kopparapu (U. Maryland), Mark Marley (NASA/ARC), Roxana Lupu (BAER), Ty Robinson (UCSC), Mark Bullock (SWRI), David Grinspoon (PSI), Christopher Stark (STSci), and Rebecca Oppenheimer (AMNH). Please address inquiries about astrobiology research at NASA GISS to Dr. Anthony Del Genio, Dr. Nancy Kiang or Dr. Michael Way.